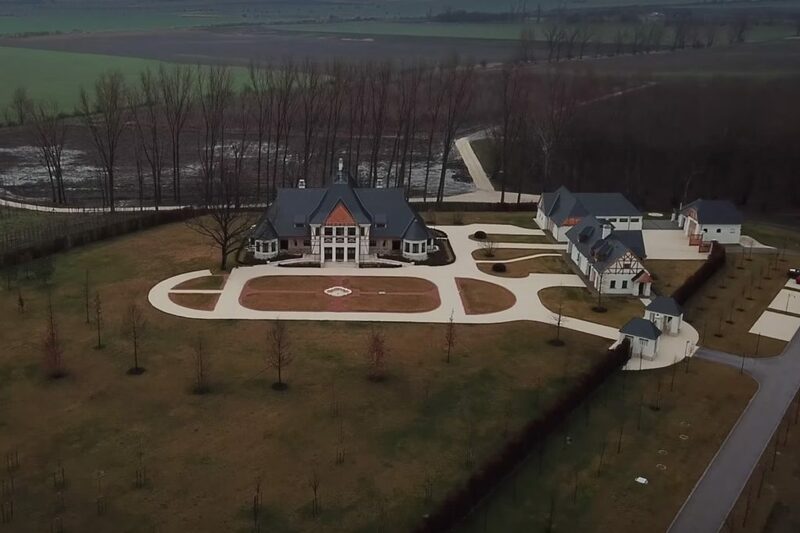 Several media outlets are focusing on a compound built just outside the city of Hódmezővásárhely encompassed by lands owned by family members of Minister Overseeing the Office of the Prime Minister János Lázár. But this story is not new. Various dimensions of it have been reported since at least 2016. Lázár, a native of Hódmezővásárhely, was the city’s mayor from 2002 to 2012, and has been MP for the area since 2002. He is an avid hunter, as demonstrated by the hundred thousand dollar hunting trips he reportedly took to the Czech Republic back in 2014. His sons, who are minors, own vineyards in Tokaj and luxury flats in Budapest and Hódmezővásárhely. According to index.hu, there was once a hunting lodging where the compound stands today. That lodge was put on sale in January 2015 for HUF 32 million. Jenő Kulik, a Hódmezővásárhely attorney, bought the old lodge in March that year. Kulik and Lázár reportedly worked together before 2002, when Lázár was the assistant to the late András Rapcsák, former mayor of Hódmezővásárhely. When Rapcsák died, Lázár took over as mayor of the city. Later, as Fidesz whip, undersecretary at the Office of the Prime Minister, and then Minister Overseeing the Office of the Prime Minister, effectively second in command in Hungary, Lázár would receive legal counsel from Kulik on issues relating to historical preservation. About half a year after Kulik purchased the hunting lodge, Lázár’s mother bought the 1.8 hectares surrounding the property. The land was also owned by the hunting club. She also purchased an adjacent property bordering the property. Another 7.7-hectare bordering property has been owned by Lázár’s young boys since 2012. In 2016, Lázár’s mother purchased a neighboring 10-hectare plot. That same day, Lázár himself purchased another neighboring 16 hectares. As the map below indicates, the only way to access the compound is by passing through Lázár family land. According to index.hu, the Hódmezővásárhely city council modified local construction regulations. That area received a special designation, allowing it to circumvent certain building restrictions. That’s when Kulik, a man not known for his material wealth or an interest in hunting, commenced construction. Index.hu writes that the value of the property is enhanced because of its incredibly close proximity to Csongrád county’s more than 19,000 hectares of designated hunting grounds. The vast hunting grounds were divvied up by various hunting clubs until 2016, when parliament adopted new regulations concerning hunting lands. In 2017, the lands were divvied up again. According to index.hu, a newly-formed hunting club – of which Lázár is a member – was awarded the rights to a large portion of the hunting grounds for 20 years. In 2017, Kulik transferred his hunting lodge property to a closed-stock company he formed, Grosswiese Zrt. The company was incorporated with HUF 283 million registered capital. Its business activities include property rental and real estate. There are two other owners of the company, István Bónus, a local businessman engaged in hospitality services, and István Szabó, a businessman engaged in agriculture. Index.hu cites a person with knowledge of the “situation”: unlike Kulik, Grosswiese Zrt.’s other owners are regarded as wealthy businessmen. As such they do not have to explain where their money is from, or explain their involvement, because the issue of the castle would be unfortunate if made public. “This is how Lázár [tries to diffuse rumors], and it’s quite successful,” the source tells index.hu. Lázár was asked about the hunting lodge at a press conference on Monday. He couldn’t say for sure what properties his family owned around the lodge. According to hvg.hu, he joked about the property. “I have two choices. Either I push for my family to sell the neighboring land, or I buy shares in the company that owns the castle,” Lázár quipped. In a piece entitled “They rent it out for a thousand Euros – the castle that does not belong to Lázár has been completed,” the journalists at delmagyar.hu, cited a statement from Kulik, explaining that the compound is available for rent but only to individuals connected to the owners. For this reason, the rental property will not be advertised anywhere. This isn’t the first suspicious hunting lodge story connected to Fidesz. In January 2017, it was reported that the Fidesz mayor of Izsák, a small town southeast of Budapest, allegedly built himself a hunting lodge with EU funds. The mayor reportedly turned the hunting lodge into a private residence, which explains why it was never advertised as being up for rent.